This book tells stories of how ordinary people in their everyday lives have responded to the challenges of living more sustainably. In these difficult times, we need stories that engage, enchant and inspire. Most of all, we need stories of practical changes, of community action, of changing hearts and minds. This is a book that takes the question, "What can I do?" and sets out to find some answers using one of our species' most vital skills: the ability to tell stories in which to spread knowledge, ideas, inspiration and hope. Read about the transformation of wasteland and the installation of water power, stories about reducing consumption and creating sustainable business, stories from people changing how they live their lives and the inner transformations this demands. Foreword. Joanna Macy. Introduction. Peter Reason & Melanie Newman. 1. What Place is This? Story of a Garden. Annie Davy. 2. Finding My Place in the Great Turning. Kirsti Norris. 3. How to Build a Lifeboat. Celia Sousek. 4. Knickers to That!. Emma Kidd. 5. Material Girl Sees the Flaw. Christine Bone. 6. I Don't Want to be a Passenger in Life. Johannes Moeller. 7. A Journey to the Heart. Patrick Andrews. 8. The Truth Mandala. Claire Power. 9. Leaping Aboard: Onshore Volunteer Work with Sea Shepherd. Elizabeth Claire Alberts. 10. Water Power. Gil Chambers. 11. The Web of Life Community Art Project. Helen Moore. 12. Discovering that We Live in an Ancient and Beautiful Universe. Helena Kettleborough & Nora Kettleborough. 13. Cabbages & Cranes: Weaving Together People and Possibility. Jane Riddiford & Global Generation. 14. The Dignity of Difference. June Boyce-Tillman. 15. Lost in Transition. Nathan Baranowski & Iva Carrdus. 16. Ghdamajori: Migration, Work and our Horizons of Care. Rupesh Shah. Drawing Out Some Threads. Peter Reason & Melanie Newman. The story behind this inspirational book is itself an interesting story. It developed partly out of a lecture given by Joanna Macy at the University of Bath in which she had spoken about ways in which we could participate in the Great Turning away from the Industrial Growth Society. Joanna contributes the foreword, outlining five principles that form guidelines for the book: come with gratitude, don't be afraid of the dark, dare to vision, link arms with others, and act your age, stepping forward on behalf of the Earth. 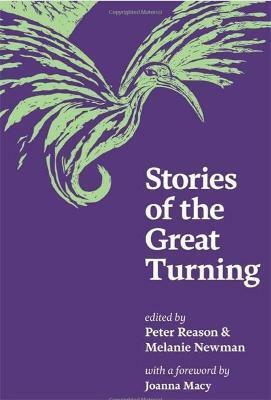 After trawling through various networks, potential contributors were invited to two writing workshops, which I am sure must have significantly influenced the quality of the writing, a striking aspect of this collection. The editors were looking for practical stories to engage, enchant and inspire. They have certainly succeeded in this quest, and any one of the stories could be used as an example. At the end, they reflect on the contributions in the light of Joanna Macy's principles outlined above. The honesty and integrity of the contributors shines through, and they have made challenging decisions that many of us might have avoided. Peter Reason is Emeritus Professor at the University of Bath where, until 2009, he taught and led research in the field of sustainability. He now focuses on nature writing for an ecology in crisis. Melanie Newman used to work in business and now teaches creative writing at the University of Winchester. She takes a special interest in stories exploring our relationship with the natural world.